What does a loyal Vermonter find when he heads over the border into the Eastern Townships of Québec? For starters, a very favorable exchange rate, some great skiing, superb food, and excellent accommodations…all, of course, with that special Québecoise flair. I’m a loyal Vermont skier, but every now and then I get the urge to venture from my home resorts. Fortunately, I live in the border country, where a short drive (with passport) takes me to several fine ski mountains in the Eastern Townships of Quebec. There I find great skiing, food, and accommodations with a special Québecoise flair … and, this winter, a very favorable currency exchange rate. 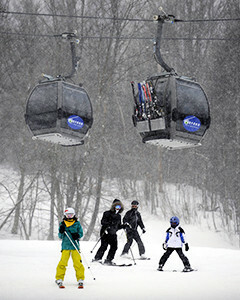 I began a recent four-resort Townships tour-de-ski at Mont Sutton. My friend Mireille Simard, a Townships resident, joined me for a dozen morning runs. It was Mireille who had first introduced me to glade skiing – scooting along one-track trails among the trees. The snow cover was still a little too sketchy for us to tackle the glades, but we found plenty of variety on the open trails, with their dozens of intersections that allow skiers to design their own routes. Best of all were the trails on what Mireille calls the “private side” of the mountain – a skein of runs off to the west, with names like Coucou, Capucine, and Alouette. When Mireille suggested we do the Sutton-IK, I said, “Satanic?” and balked – but I’d misheard, and took off down a nicely groomed, arrow-straight cruiser. After a final afternoon run down Miracle, which starts as a black diamond (expert) trail at the mountain’s 840m (2756’) summit, I headed down to the village of Sutton, a scant ten minutes from the resort. Sutton’s main street bustles with shops, restaurants, a snug bistro called Le Cafetier that serves immense bowls of café au lait, and a temple of cheese and charcuterie, Le Rumeur Affamé. My favorite eatery in town, La Fontaine, offers a tasty table d’hote and is popular with locals who take long lunches over wine – a sure reminder of just who settled Québec. Standing atop Mont Sutton, I’d had a direct view of my next destination. 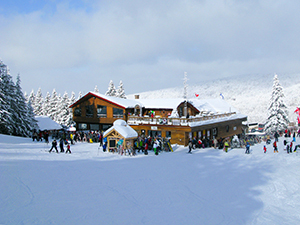 Mont Brome, with its triple summit and seven mountainsides of ski trails, looms large and unmistakable above the gentle terrain of the Western Townships. A 40-minute drive north brought me to…well, I thought it would be the town of Bromont, but it turned out to be a brand-new nest of outlet shops, dominated by a big stone chateau of a hotel, Le St-Martin, where I checked in for the night. But I put aside my curiosity as to whether there was an actual town when I looked out from my room, as dusk fell, at the great hulk of Mont Brome illuminated for night skiing. Bromont has tremendous variety, and enough of a mix of trails for different skill levels for it to compare favorably with the better-known Tremblant, up in the Laurentians. And it has views. When the snow let up, Joe pointed east to Mont Orford and Owls Head, both of which were next as I connected the mountain dots, with each destination visible from the one before. That break in the clouds prefaced the week’s only rain, so I left the mountain in mid-afternoon and went looking for the town. It does exist, as what locals call the Vieux Village – the old town – strung along rue Shefford and dominated by a massive church whose radiator-paint spire is quintessentially Québec. Tucked into spruce Victorian houses and business blocks were all the shops, bistros, and auberges of a ski town – and, on the outskirts, something more unusual, a place called the Museé des aromes – the museum of scents – an emporium offering hundreds of site-distilled essential oils, many made with local botanicals. If you’ve got someone to give you an after-ski massage, here’s where to get the oil. A quick drive east took me to the secluded all-suite Estrimont, practically in the shadow of Mont Orford. Saving my fireplace for later, I went downstairs for a drink and the most unusual dinner of my trip, at the hotel’s Le Pierre de Feu – the stone of fire. I’d never tried hot stone cooking before, but I will again, after doing a filet of bison to a rare turn on a 400F-degree-plus square of volcanic rock. It was preceded by something even more unusual – a mini-wheel of baked brie, served within a nut-strewn puddle of sizzling maple syrup, then splashed with triple sec and ignited. If it sounds over the top, it was, and it was delicious. So was the skiing next day. Mont Orford stands within a provincial park, and like Mont Brome sprawls over three summits – Mont Giroux, Mont Alfred-Desrochers, and the eponymous peak itself. I knew I’d arrived at a serious ski area when I walked into the lodge to get my ticket and saw a display case with medals won by Orford habitués at the 1994 Olympics at Lillehammer. Skiing with a retired Royal Canadian Mounted Police officer, Richard Dion, I enjoyed first tracks on a race practice trail, Jean d’Avignon, just opened for the day. A hybrid lift – chairs and gondolas share the cable – ascends to Mont Orford’s 850m (2789’) summit, highest in the Townships, and to a slew of black diamond trails and one cruiser, the Grand Coulee, that threads the col between Orford and Alfred-Desrochers. 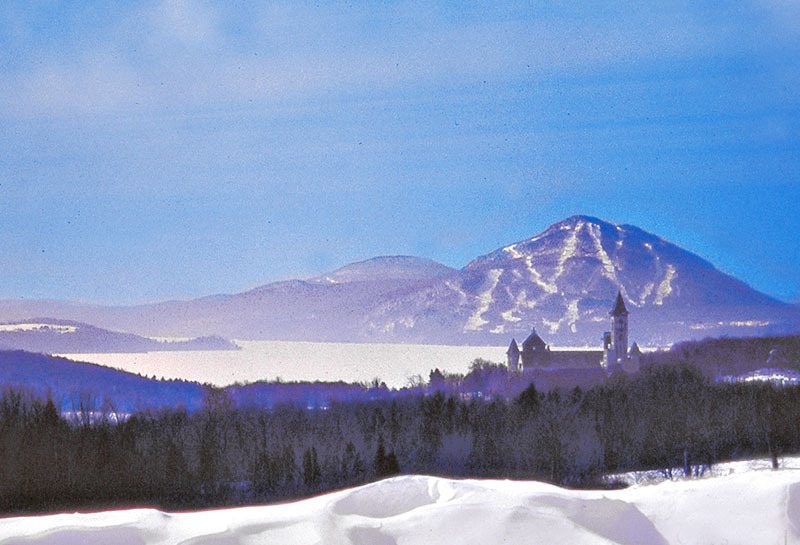 Memphremagog – the 33-mile long lake that slices the border and extends deep into Québec – was the special attraction of my last skiing stop, Owls Head. Still owned by Fred Korman, its 1965 founder, the 52-trail resort could be described as a view with a ski area attached, if that weren’t a slight against the Townships’ smallest, down-homeiest, and perhaps most imaginatively designed skiing destination. I got the down-home feeling right away when I checked into the ski in-ski out Auberge Owls Head, which is attached to the bar and restaurant, which is attached to the ticket office, which is attached to the cafeteria where they serve chili made to Mrs. Korman’s recipe. Still, the skiing has to be as much a draw as the atmosphere. Owls Head accomplishes this by a clever gradation of skill sectors across the face of the mountain – roughly east to west, bottom to top, trails progress from easy to expert – and by making good use of every contour in the stand-alone peak’s profile. My favorite trail combination of the day took me from the summit down the black-diamond Standard, and then onto a race trail called the Shady Lady. But the one I kept coming back to was over on the lake side. It’s called Lilly’s Leap, and it has just the right combinations of steeps and skiddy sharp curves. Its main attraction, though, are those views – views that have often been compared, according to my Owls Head skiing companion Luc St-Jacques, to those from the trails above Lake Tahoe. The mountains of Vermont roll off to the south; Mont Orford rises to the north … and directly below, ice-coated at its two extremes today but still deep blue in its broad central expanse, lies Lake Memphremagog. I’ve never seen a finer sight from any trail I’ve skied. I’ll always ski Vermont. But for a special change of pace, I’ll ski the Eastern Townships. 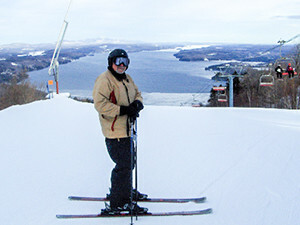 Skiers planning to sample two or more Eastern Townships resorts can take advantage of the “Ski Dans l”Est” passport. 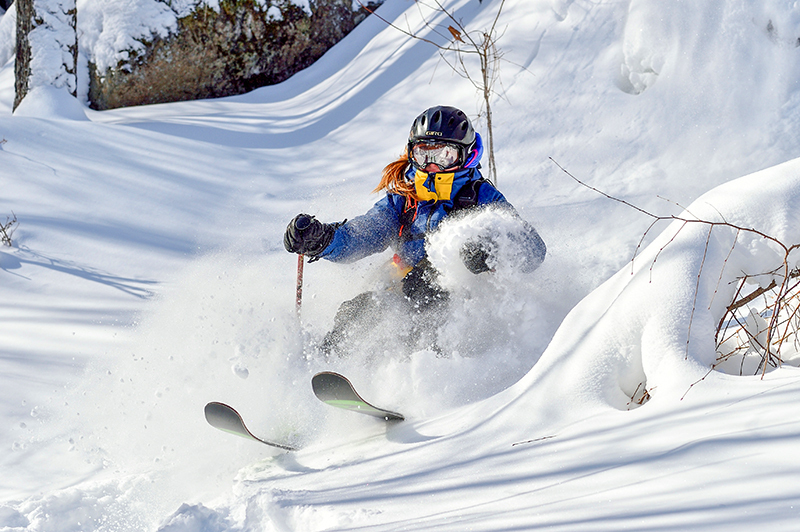 Priced at just $25 CDN (approximately US$18 at the time of this writing), the passport entitles holders to a 25% lift ticket discount at each of the four mountains, as well as a similar discount at six participating hotels (skidanslest.com). 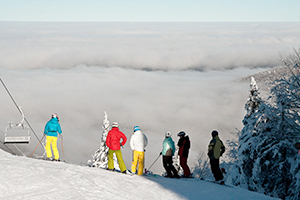 Western Canada also offers skiers a cluster of top-notch resorts within an hour’s drive of each other. The Lake Louise Ski Resort, Sunshine Village, and Mt. Norquay (collectively known as SkiBig3) are located in the Alberta Rockies, just west of Calgary. Superb accommodations are available at the Fairmont’s Banff Springs Hotel and Chateau Lake Louise.